Easter Hope Festival is just around the corner! 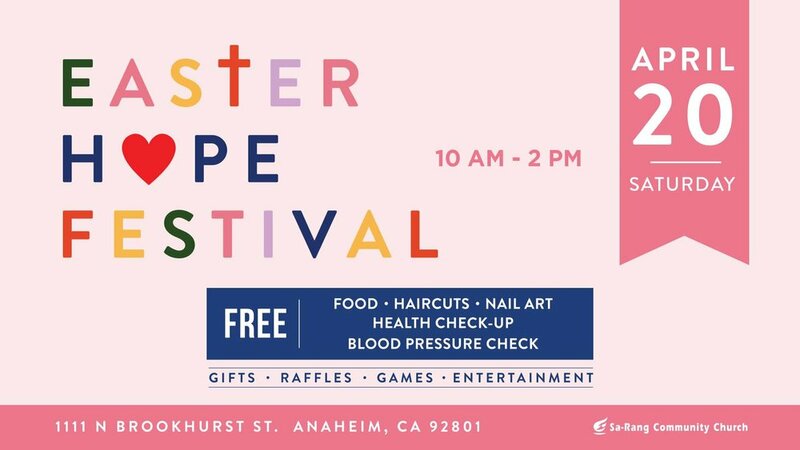 Join us for our annual Easter Hope Festival, the day we invite over a thousand of our neighbors around the city to celebrate and share the Good News of Christ! The “Gift Shop” booth is one of the most popular booths and it’s all due to the generous and thoughtful donations we receive! From clothing to school supplies, we collect all sorts of items (new/like new) to give to the community during the event. For a list of items you can donate, click the button below. Don’t know what exactly to donate? Want to leave it to the team to determine how to best steward your dollar? Financial donations can be made using the green Boaz offering envelopes on Sunday. Please write “Easter” on the envelope to ensure that your donation gets designated to this event. Every year, Easter Hope Festival is only possible with the help of our amazing volunteers! This year, we have speciﬁed a number of shifts that you can sign up as an individual. Click below to see all the volunteer opportunities.